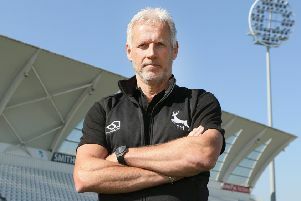 Head coach Peter Moores hailed “as good a four-day win as I’ve seen” as Nottinghamshire extended their lead at the top of the Specsavers County Championship’s First Division. After newly-promoted Notts had beaten Hampshire by 203 runs at Trent Bridge for their third win in four games, Moores (pictured) said: “I’ve seen loads of games of four-day cricket, and that is as good a win as I’ve seen for a team being on the front foot all the way through. “From how we batted to how we fielded, we pushed the game through and got our just rewards at the end. New captain Steven Mullaney, whose century helped Notts to their victory, said: “Sitting nicely at the top of the league after four games is probably better than any of us could have imagined at this point.